First Ed. 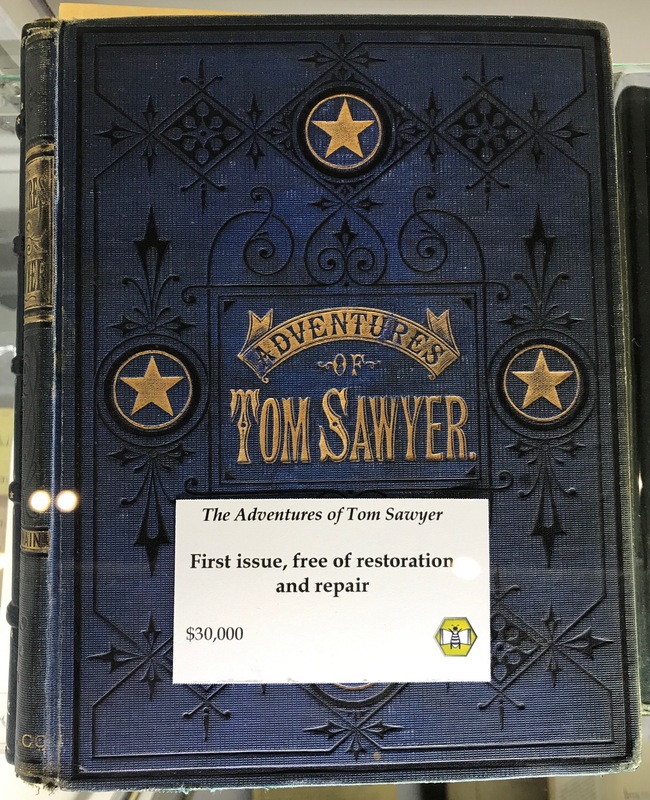 Tom Sawyer, seen at the 2019 NYC Armory Book Show a few weeks ago. Twenty years ago this Tom Sawyer, and other expensive first editions, were often extensively restored. This often involved a lot of conservationally questionable work. Redying or painting abrasions in the cloth, sophisticating the text with better boards from later editions, mixing partial textblocks with better condition plates were all common practice. Anything, really, that would make the book appear in more pristine condition. Dust jackets, often worth more than the book they covered, were treated similarly with invasive, invisible, and often irreversible restoration done to make them look brand new. And now, the untouched ones are worth more than ones that has been messed with. Uh-oh. And if the label on this Tom Sawyer is a harbinger of the market, things are changing for the books too. I personally became interested in old books because I liked the way old books looked, and didn’t want to change that. Generally speaking, old books and other old things are becoming more valuable when they are genuinely old, exhibit use value, have wear, patina, history, and character. Authenticity, in a word. Three reasons for this come to mind for this change: we spend more time virtually, are overwhelmed with disposable objects that can’t be fixed or retained, and there is a dwindling supply of unaltered old objects. I’m sure there are others. A recent NY Times article about high end watches neatly summarizes some reasons for the appreciation — romanticization?— of older watches, which also could apply to books. “… old watches are considered cool: They have patina, provenance, soul. And for a generation of men (and yes, vintage watches seem to be an obsession largely for men, with apologies to Ellen [DeGeneres]) who value the analog-chic of antique mechanical watches, just like vinyl records and selvage jeans… .” A millennial friend of mine likened the record player in her living room to a fireplace: of course it is not necessary, but it is comforting to engage with a durable antiquated technology that takes a little bit of attention and care. It wasn’t an audiophile’s opining: she liked the thingness of it. There is an imposing presence when you hold an older book in your hands. A Benjaminian “aura”. Somehow just knowing this object has seen so much over the years impacts us. The scars, damage, wear, uniqueness, and trauma an object has encountered can often add aesthetic and sometimes even informational value. An extreme example might be the books that were damaged while by stopping a bullet, possibly saving a life. Despite being mass produced, nineteenth century titles are often unique, due to the amount of handwork that went into them at various stages of the binding, and the physical traces from their existence in time and space. Yet I fear the book dealer’s sign on this Tom Sawyer may swing the pendulum too far. Although I only looked at this book under glass, I could think of a few very minor treatments that would greatly extend the life of this object when handled, without impacting its aesthetic value, use value, patina or other inherent qualities. Is “free from repair” a good thing if the joint continues to tear with each opening? Or was the dealer sophisticated enough to distinguish between restoration, repair and conservation? A professional conservator (i.e. me) takes their ethical obligations to the object entrusted to their care seriously, and most of us pledge to do this in writing. The AIC guidelines for practice specifically discuss compensation for loss and reversibility. Restoration treatment may or may not reversible: conservation treatment always should be. This may be the main reason for the notice on the Tom Sawyer book: a future owner could move forward with a more invasive treatment, depending on the intended uses of the book, but could not go back. And this affects the value. Are we finally witnessing a place for conservation oriented book treatments in the marketplace and recognition in the public sphere? 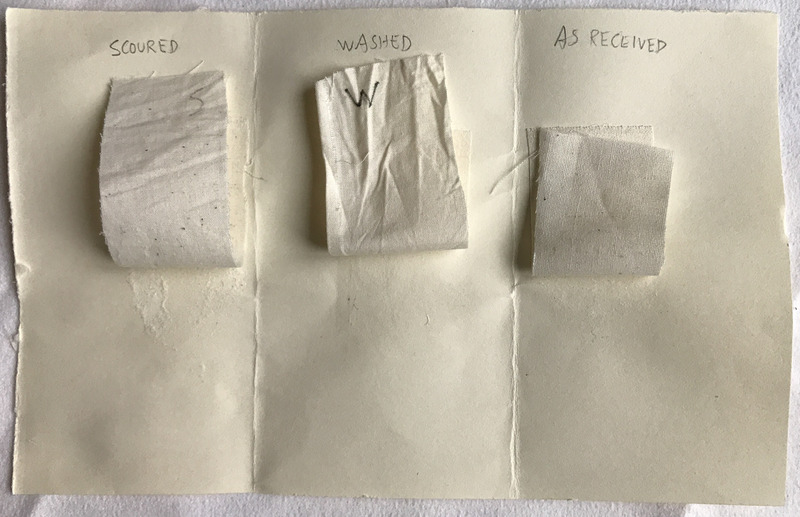 Last summer I recorded my investigations into replicating early 19th century book cloth using XSL pigments. One difficulty was achieving an even coloring, and several commenters indicated I should scour the fabric, rather than just wash it. Finally, I had a little time to try this, and although I haven’t had a chance to do more dying, tests with wheat starch paste have been astounding. Note all the yellowish junk that came out of the muslin: oils, waxes, and pectic substances. I boiled 1.5 yards of Springs Creative 45″ unbleached muslin (133 x 72 thread count, .007″ thick, $4.00 a yard) for two hours in a stainless steel pot, using 1 tablespoon of soda ash per 6 cups of water. Since it smells a bit, it is advisable to have a externally vented exhaust hood. A long stirring stick is necessary, as are rubber gloves. Keep a close eye on the boiling muslin. I used large pieces of cloth, for future use as covering material. As the water boils, hot areas form bubbles under folded and wrinkled areas. Then when you stir, they get released and the pot bubbles over, or worse, spills on you. 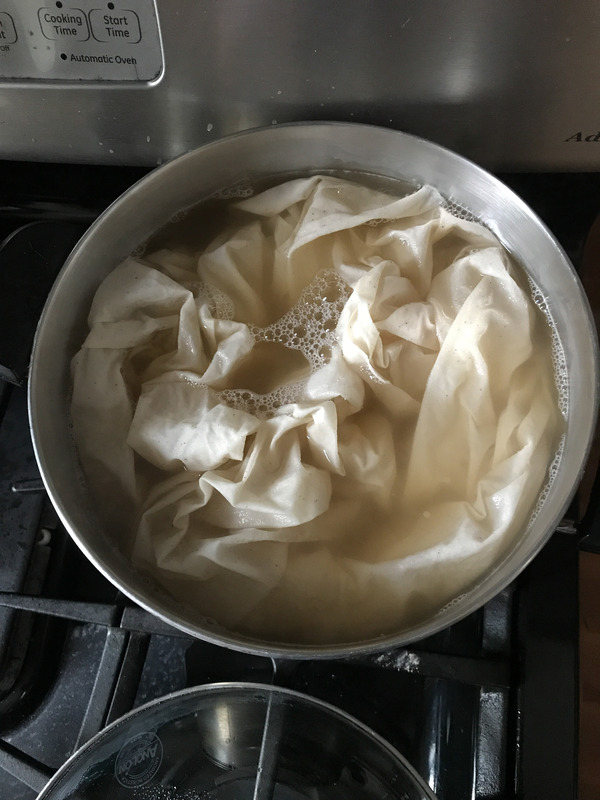 I stirred the pot every 15 minutes so that all cloth surfaces were exposed to the scouring, and adjusted the temperature as necessary to keep an even boil. The scouring raised the pH of the cloth from around 5 to 7, though this was measured with testing strips and is likely not super accurate. Soda ash is around 10 or 11 pH. The scouring removed oils, waxes, and pectic substances. The cotton fibers swelled and softened during the process. Muslin samples pasted onto Mohawk Superfine. Left: Scoured. Middle: Washed. Right: Untreated. Note the superior adhesion of the scoured sample, skinning the paper during a pull test. The difference in adhesion between the scoured, washed, and untreated samples is remarkable. All were pasted with Aytex P wheat starch paste onto a piece of Mohawk Superfine, with the same weight during drying. I testing the adhesive strength by pulling the fabric away from the paper at 180 degrees. The scoured sample delaminated the paper, while the washed sample (hot water, a tiny bit of Seventh Generation Free and Clear detergent, industrial washing machine) and untreated sample released without affecting the surface of the paper. I tried this two more times, and the results were the same. In a separate test using EVA all the samples delaminated the paper. I’d like to get a push-pull gauge to quantify the adhesion a bit more rigorously. Of course, there may be circumstances where a weaker adhesion is desirable. 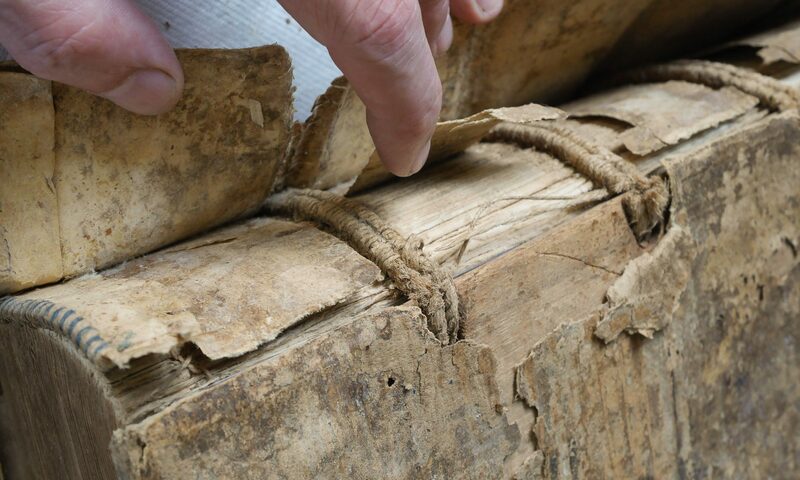 But for most book conservation applications — spine linings, board slotting flanges, hinges, sewn stuck-on endbands, covering material — strong adhesion is desirable. The Conservation of Dante’s 1477 La Commedia. Lecture Synopsis. Ndpreservation posted a nice synopsis of my lecture about the conservation of Dante’s 1477 La Commedia. It was an interesting and time consuming treatment, involving both resewing and rebinding in an alum tawed goat conservation binding. This treatment provided impetus for further investigation into the history of conservation binding, both the term and the practice. I will present an updated version of this lecture on November 7, 2018, 10:00 am, Jones Room, Woodruff Library, Emory University, Atlanta, GA.
I’ll also be teaching “The Conservation of Leather Bindings” that week at Emory. The application deadline is this Friday, September 14, 2018. Synopsis of the Dante lecture from ndpreservation.